Police have used teargas and “flash” grenades to break up hundreds of Occupy protesters after some demonstrators started throwing rocks and flares at officers and tearing down fencing. About 300 people were arrested in the most turbulent day of protests in Oakland since November, when police forcefully dismantled an Occupy encampment. Police said the group started assembling at a central plaza on Saturday morning, with demonstrators threatening to take over the vacant Henry Kaiser convention centre. The group then marched through the streets, disrupting traffic. The crowd grew as the day wore on, with afternoon estimates ranging from about 1,000 to 2,000 people. The protesters walked to the vacant convention centre, where some started tearing down perimeter fencing and “destroying construction equipment,” according to police. Most of the arrests came around 8pm, when police took scores of protesters into custody as they marched through the city’s down town area, with some entering a YMCA building, police spokesman Jeff Thomason said. Police said they issued a dispersal order and used smoke and tear gas after some protesters pelted them with bottles, rocks, burning flares and other objects. More help from other police agencies was also sent to Oakland, with busloads of Alameda County sheriff’s deputies arriving in the central area late Saturday. The demonstration comes after Occupy protesters said earlier this week that they planned to move into a vacant building and turn it into a social centre and political hub. They also threatened to try to shut down the port, occupy the airport and take over City Hall. Interim police Chief Howard Jordan also warned that officers would arrest those carrying out illegal actions. The national Occupy Wall Street movement, which denounces corporate excess and economic inequality, began in New York City in the autumn but has been largely dormant lately. Oakland, New York and Los Angeles were among the cities with the largest and most vocal Occupy protests early on. The demonstrations ebbed after those cities used force to move out hundreds of demonstrators who had set up tent cities. 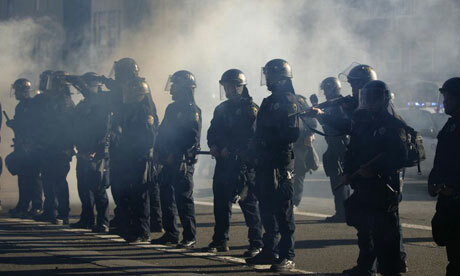 In Oakland, the police department received heavy criticism for using force to break up earlier protests. Among the critics was Mayor Quan, who said she wasn’t briefed on the department’s plans. Earlier this month, a court-appointed monitor submitted a report to a federal judge that included “serious concerns” about the department’s handling of the Occupy protests.